Delhi is a huge metropolis with a developed infrastructure yet cows walk along its streets to create traffic jams and occupy sidewalks. But nobody’s hand would rise to disturb them. 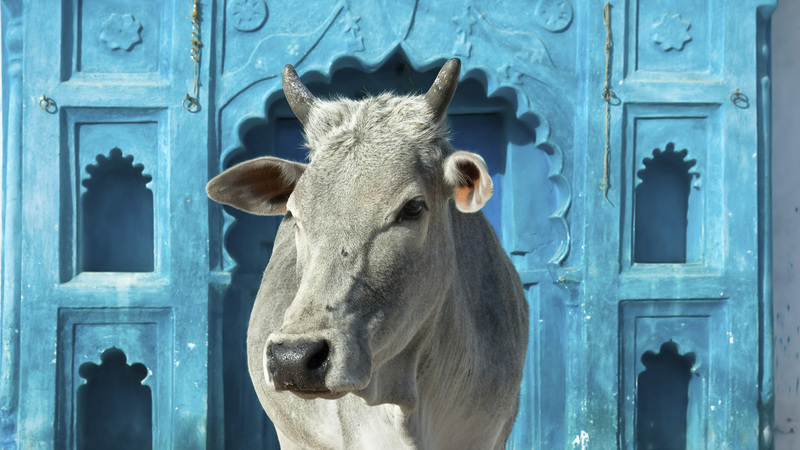 In India a cow is as nearly as a deity, its rights are stipulated on legislative level. There are hardly many people who can be surprised with this information. Because the fact that cow is a sacred animal in India is common knowledge. Love of Indians to the cloven-hoofed is so famous that even a word combination “holy cow” became a set expression for many peoples of the world. Ancient reverence and worship of these animals is reflected in reality even today. But there are other unrenowned cities in this world where other animals are revered. In certain countries entire islands belong to them completely… And these are the ones we feel like telling about. In the waters of the Sea of Japan an island is lost where rabbits run the show. Okunoshima is a unique island that becomes increasingly famous around the globe under the name “The Island of Rabbits”. It is located in Hiroshima Prefecture nearby Takehara city. There are no local citizens on the island – there is a small hotel and a camping for tourists, a golf course as well as numerous hiking routes to main landmarks instead. On the island there are even special employees who make sure that rabbits are fed and happy. Currently about 1000 various rabbits live there freely. Rabbits’ settlement prospers there and its dwellers get the most out of life having completely forgotten fears of their fellows. There are no predators on the island at all. They don’t need a master’s hand and treat guests favorably: accept gifts, jump on their knees and allow stroke themselves. For that they are spoiled with attention of numerous tourists who annually go there in large flows especially to visit this rabbits’ kingdom. Should you go there – make sure you’ve grabbed delights for masters of the island – cabbage, carrots or a special food. And bear in mind: entrance with cats and dogs is strictly prohibited there. The word is that present-day happy baby-rabbits are the offspring of accidental survivors who were used for experiments on poisonous gas efficiency. Supervisors deny such a possibility though. According to another version, rabbits were accidentally brought to the island by schoolchildren who came there for a visit to Poisonous Gas Museum. Currently Poisonous Gas Museum operates on the island as a reminder about terrors of use of chemical weapons. Also, remains of old buildings and fortresses that the super-secret island was surrounded by constitute interest for tourists. A trip to the island can become an excellent leisure time – playing golf, swimming in clear water of the sea, visiting historic landmarks. As well as walks with cutes creatures. Not far from Latvian capital (Birzes town) there a symbolic town of rabbits built akin to human cities. Small houses in the style of 19th century architecture with miniature street lights, a well with water and even skyscrapers – all in all, every attribute of a true city only for small citizens: fluffy and long-eared animals. 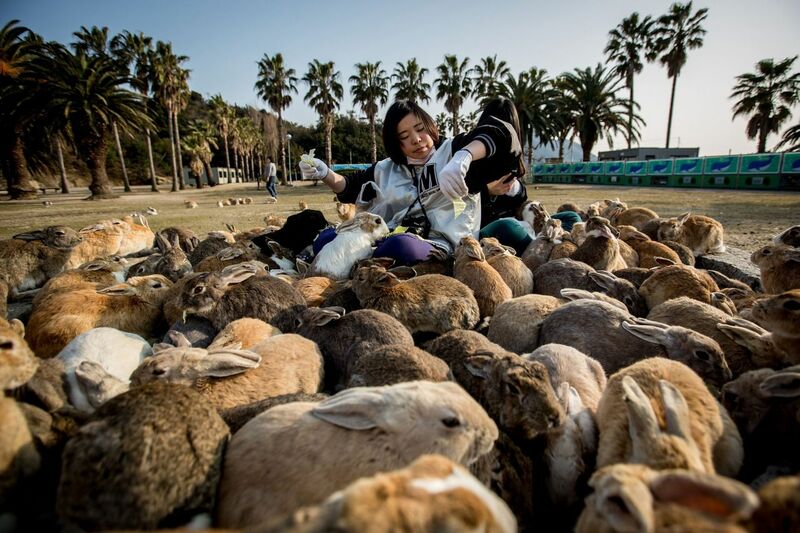 This town is 2.5 sq km in territory and slightly fewer in population than the Japanese island – currently about 700 rabbits inhabit it. And breeds are presented in abundance there – 65. An unusual rabbit-town was built by a professional carpenterOjārs Narvils – that’s an occupation he found for himself to cure pain of an unhappy love. 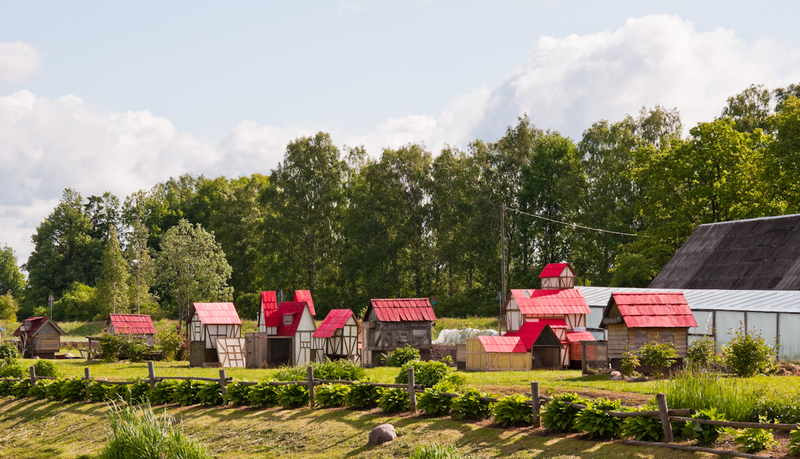 Today Ojārs is the town’s Mayor of Honor and this hobby brings him some good income because inflow of tourists to an unusual settlement never stops. And he, being a noble mayor, takes care of his citizens – improves infrastructure, consults rabbit-breeders about their keeping and brings in new breeds. Peacocks are startlingly beautiful rare creatures. And majority of people were lucky to see them at a zoo. But in a small American town they walk freely in the streets and even outdo local population in number. This town is called Rolling Hills, it is located on Palos Verdes Peninsular (not far from Los Angeles) and about 1000 peacocks live there. And this is no doubt an interesting and attractive city for tourists. People go there to admire beautiful panorama of mountains and might of the ocean. But sure enough main landmark is peacocks that rest on roofs of houses, trot on sidewalks and hang on trees. Peacocks have lived in the city for about a hundred years. No one knows for sure where they came from but a theory exists that peacocks were a present to the daughter of a local rich man who owned lands of the peninsular back in 1920s. They happened to reproduce and began to feel themselves rightful masters of the island. Over this time citizens learned to live in peace with most beautiful birds. Local authorities support peacocks in every possible way by introducing special programs with rules of behavior and of keeping them. But there is rain even to the best parade, though. 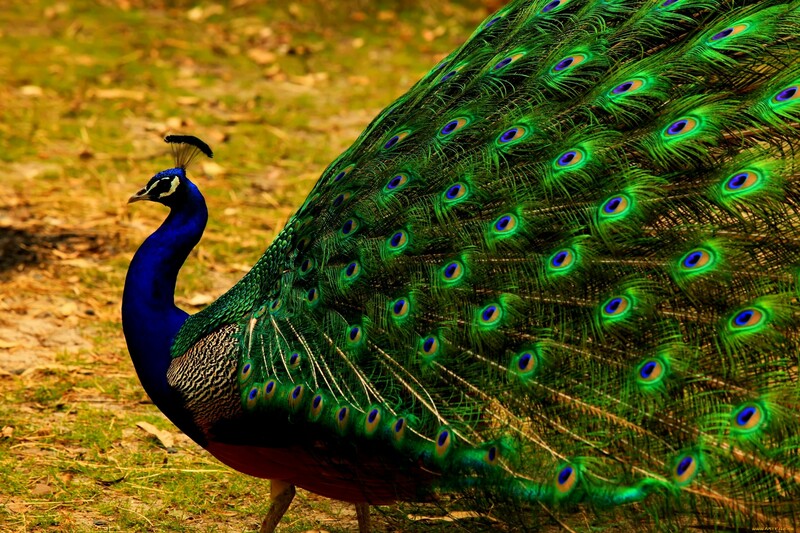 The thing is that visually graceful peacocks are in fact large in size and thus can harm possession of citizens – scratch autos, damage roofs of houses and make a lot of noise at night. This makes some believe that it is justified to kill them. However local authorities and animal advocates have no intension to treat murders tolerantly. Currently crimes against peacocks are persecuted and investigated and offending persons are to pay fine in the amount of 200 thousand dollars. Majority of population agree to put up with inconveniences in the name of beauty and peaceful life of peacocks – they cannot even imagine their native Rolling Hills without the birds. In Japan they treat respectfully all the animals therefore there is not one but several unique cities of animals. To the south of Kyoto there is a small but landmark-wise rich town Nara that was the capital of the Land of the Rising Sun back in 8th century. For over a thousand years deer participate urban life on equal terms with people there. Deer feel free there and even lead a life of sybarites – enter restaurants and cafés, surround tourists hinting at being given presents and sometimes it even happens that they steal wallets confusing them with food. Deer there have own splendid park but they enjoy casual walk along the streets, too. 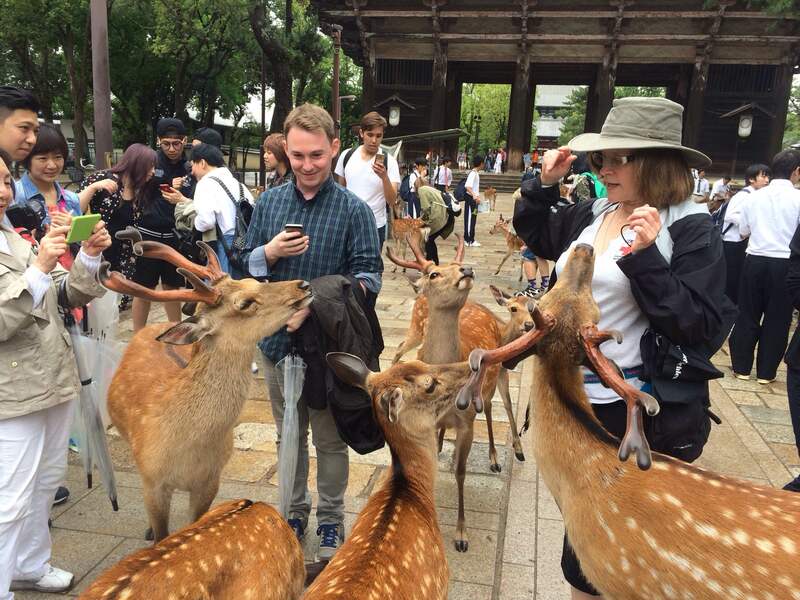 Therefore one can come across deer as nearly as on every step in Nara and the animals are allowed to do everything. Local authorities have even established special slot machines with salted crackers (Shika-senbei – deer cookies). 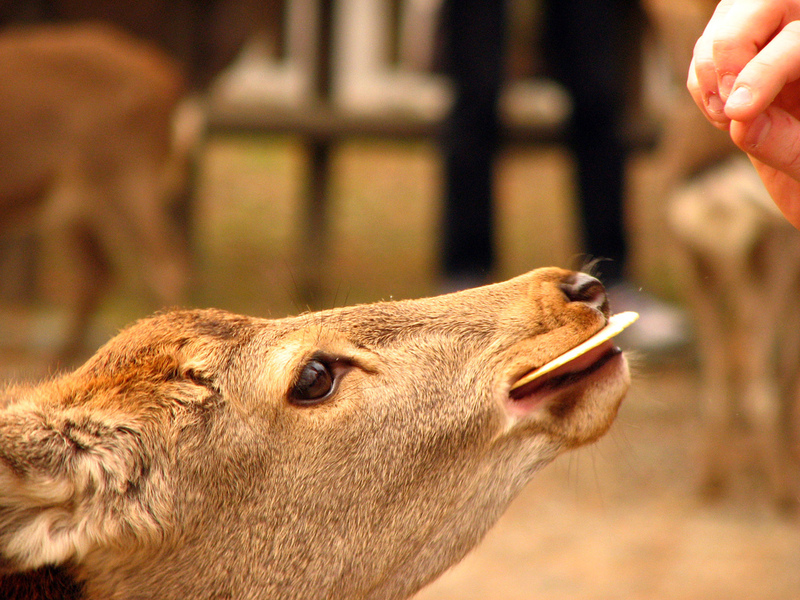 Deer are recognized national heritage of Japan and are protected by law. Previouslymurderofadeerledtoexecution. Lasttimeithappenedin 1637. Since then a single crime against these animals hasn’t been registered. Such attitude was courtesy of an ancient legend. It reads that the first Emperor of Japan descended from the skies on a white deer to those lands. Thus all local deer are the offspring of that legendary one. They should be revered and they, in their own turn, protect the city from all troubles like a deity. Alongside deer, Nara has other things to attract tourists – ruins of majestic erections, numerous temples and world’s largest statue of Buddha. Amazon River – the river that not only South America but our entire planet cannot be imagined without – seems to have been explored length and breadth. But somehow every year scientists find out something about it they’ve never thought of before. We tried to gather most interesting and least-known facts about it in our feature. The cold season brings not only such important things as wrapping into a reindeer sweater, drinking hot chocolate and once again reviewing Christmas comedies. Thus, sport has not been canceled yet, so OUTLLOK compiled top five ski resort bucket list for you to cheer up and get out of your winter sleep. Embraced by Autumn: Where to go on mellow season? Autumn promises that heat would gradually fade away and immediately presents with a choice: either to clutch at stewing days in warm countries or taste cool evenings and admire architecture without being distracted by sultriness.